While most brides spend the day before their wedding at the spa, getting their nails and hair done, this fit bride opted for a mountain biking excursion instead! I love receiving unique engagement photos (I mean, hello!) and especially those that tie into what the couple loves, how they met, or a healthy hobby they share. Such is the case with Stephen and Suki, who decided to capture their engagement at a place they love, doing what they love - jogging a familiar trail! These two are seriously adorable and they don't need fancy clothes, props, or anything else to be able to see the love they so obviously share! Congrats guys! 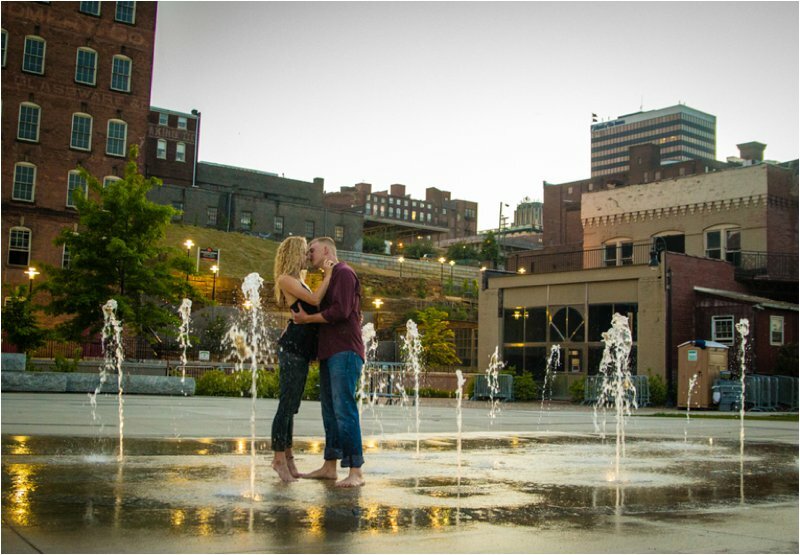 We selected downtown Lynchburg for their engagement session in order to mirror their first date, which was dinner at Waterstone Pizza, meandering through Blackwater Creek Trail, and visiting the Lynchburg Community Market! They met on a weekend scuba diving certification trip a couple of years back and their meeting sparked Stephen to get in touch with Suki just a week or so after. I guess you could say that the rest is history! Stephen and Suki are very active! Since they run frequently on the trail system, it was a great backdrop for their first outfit choice! Stephen is in the Army Reserves and stays fit, and Suki was a college cross country/track team athlete and currently coaches high school cross country as well. Thanks for sharing your sweet photos with us, Stephen and Suki! Would you consider recreating your first date for engagement photos? How about incorporating something you both enjoy?